I must confess, I get really confused when choosing the right car seat, it just seems so complicated… different sizes, different ages, different weights, different bases and some face different ways too! Yet, car seats are one of those purchases you make very informed decisions about. If you’re looking for a safe but flexible car seat for a child between 0 to 18kg (that’s birth to roughly 4 years old) then you might want to read on. Better head, neck and all over protection due to first-ever standardised side impact testing. 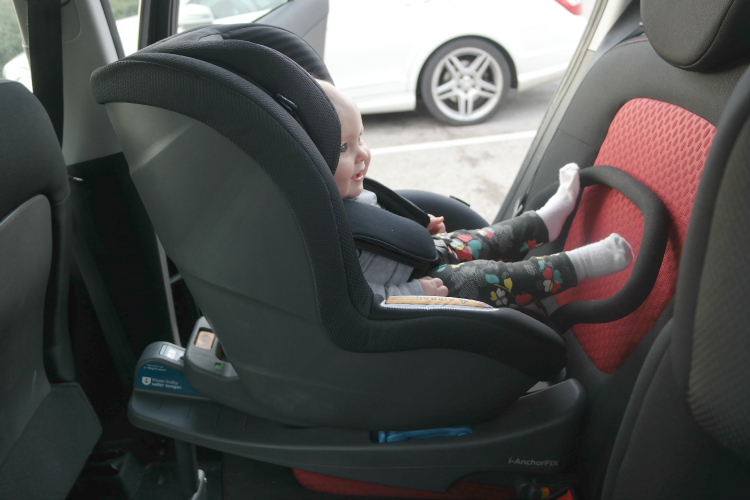 Mandatory rearward-facing travel to 15 months allows baby’s neck to develop and strengthen for forward-facing travel. All new, advanced technology crash test dummies simulate a child’s fragile body with much more accuracy. Required ISOFIX means less room for installation error and ensures i-Size car seats will fit most current ISOFIX vehicles. Seat usage is now classified based on a child’s height instead of weight — ensuring a more accurate fit for growing children. 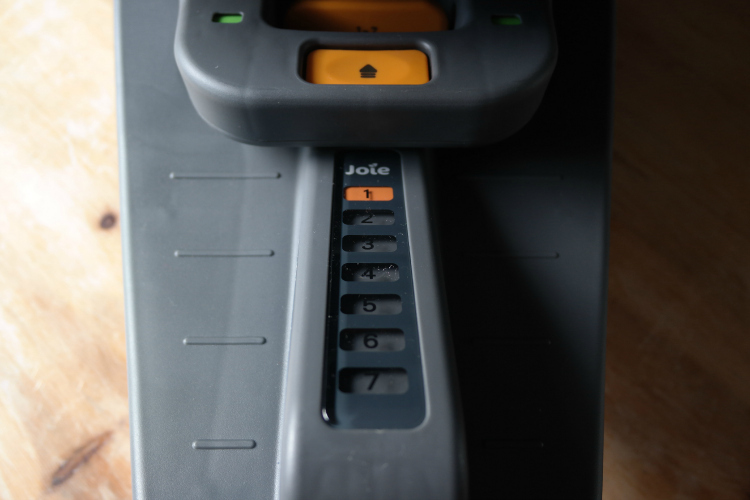 Joie i-AnchorSafe™ System car seat and base are really easy to install. Even if you don’t have ISOFIX connectors in your car, you can still atatch the base using your seat belts – and if you do have connectors – you can attach using both methods for even more security. It all took a matter of minutes to install and feels extremely secure. I think the addition of the bumper bar when rear facing makes a big difference as the seat feels less likely to move or (god forbid) tip forward should there be an accident. As Eleanor is only 8 months and little diddy legs (sorry Eleanor, that’s the Adams gene *raises hand*), we have the seat rear facing and fully reclined. The head rest moves up and down to suit your child’s height and also comes with a nice comfy newborn insert and padding for the straps for the tiniest of frames. You’ll see in the next video how to install the base/seat as well as adjust it’s positioning but rest assured it’s all relatively simple to do and there’s lots of clear indicators to tell you when something is secure/not secure. I for one would’t be going anywhere unless I hear that nice big reassuring ‘clunk’. I know this is by far not the most important aspect when it comes to car seats but it’s nice when products are equally as good to look at as they are functional and Joie certainly don’t let us down with their products. The i-AnchorSafe feels and looks high quality with nice thick padded seats and a shell-like back and is also available in 4 different colours (the Caribbean – blue is my personal favourite). The only negative for me is that the bit of seat belt that falls between Eleanor’s legs is quite close to her, so I’m finding that I need to loosen the straps quite a bit to ensure I don’t catch her leg when I’m buckling her in. It’s not something that’s a huge chore though as loosening the straps is easy to do (though not so easy that a child could find it!!) and I’m usually adapting the straps all the time anyway to suit different thickness in clothing. I think if I had been shopping for a car seat from birth then this would have been top of the list – it’s super safe, comfortable, adaptable, easy to install/adjust and suits the varying heights and lengths of children as they grow. Plus I think the price point is really competitive, given that I’ve seen the base and seat unit selling for only £260 which is on the lower end in comparison to other car seats of this quality. It’s a thumbs up from us Joie!! The lovely Danni from: http://www.itstartedwithasquish.com/joie-i-anchorsafe-system-car-seat-review/ reviewed the i-AnchorSafe Car seat for us.